1. Have a great heavy duty grill pan. This was one of my first big-time investments kitchen-wise. I have only 2 Le Creuset pieces, a grill pan and a Dutch oven. To me, these are the 2 indispensable pieces of cookware that can assure a different level of cooking for the home practitioner. 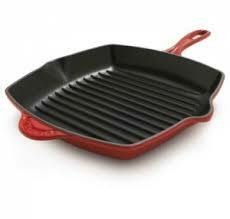 The biggest advantage of this cast iron grill pan is that it allows a really high heat for an excellent sear. Iron tends to heat up slightly slower so I usually put the pan over a high flame and deliberately walk away for a bit so that the pan has the chance to get to a roaringly high temperature. It is important to know your meat and the different cuts of meat. My personal favourite is the rib-eye, which was my indulgence this past weekend. Hubs prefers the loin (sirloin or tenderloin) instead. Of course now it is possible to use less tender cuts of meat such as chuck or short ribs and to get an excellent degree of tenderness by cooking the meat sous vide first before finishing it off with a good sear. I love my Anova sous vide circulator; I haven’t quite delved into all the secrets of sous vide cooking yet (although I have been terribly impressed at the quality of 72 hour sous vide shortribs). Adding salt too early can draw moisture out from the steak and affect the consistency of the steak. I usually use sea salt and freshly ground black pepper for the steak just before putting it on the grill pan. The other thing to remember is to use a neutral flavoured oil (I usually use vegetable oil). I usually put a dash of oil into the grill pan and watch for a bit of smoking before putting the steaks on. Most times I aim for medium rare done-ness (I still think it’s a travesty when people I know ask for a well done steak…) which means that a 2 cm thick steak would probably need 2 minutes per side. The doneness of the steak can be checked with a meat thermometer or the quick and easy cheat is to compare the consistency of the palm (under the thumb) compared to the meat. When putting the thumb and index finger together in an “OK” sign, you are supposed to use the index finger of the other hand to press down on the part of the palm below the thumb (thenar eminence for my medical friends out there). The consistency of the steak can be compared to the “bounce-back” of the palm when the index finger is opposing the thumb (rare doneness), or when the middle finger opposes the thumb (medium rare), or when the ring finger opposes the thumb (medium) and when the ring finger opposes the thumb (well done). Allow the steaks to rest about 5 minutes. In the meantime, work on the enoki mushroom topping so that it will be done just as the steaks are well rested. But enough of the steaks. I usually make sure there is a side of either salad (for me) or broccoli for the kids (kid #2 almost exclusively eats broccoli only when made to eat vegetables). 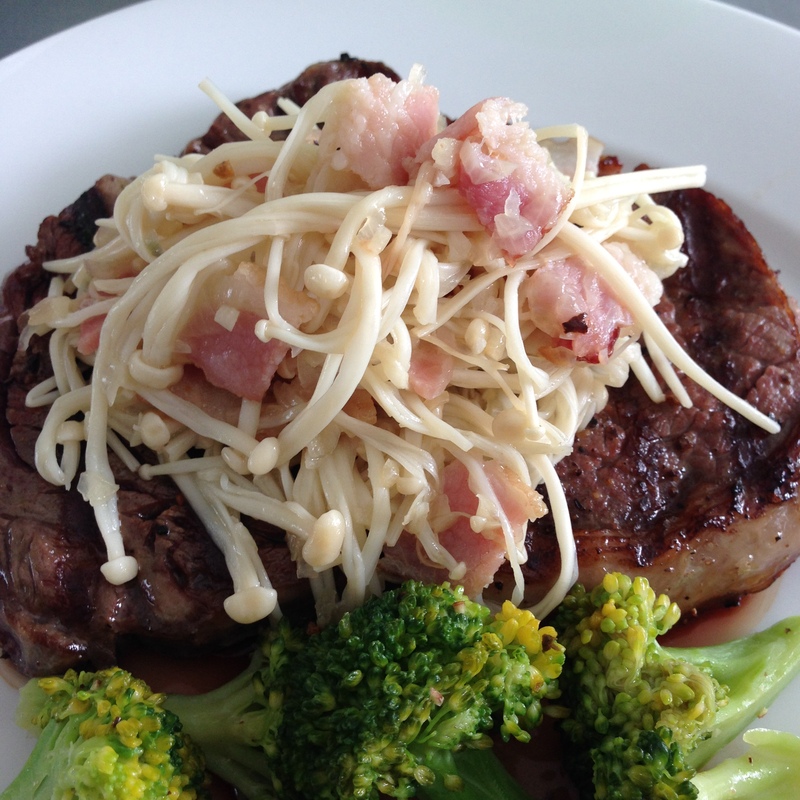 Here is the recipe for the enoki mushroom topping for the steak. 1. Heat up a frying pan or wok and put butter in. 2. Allow the butter to melt and brown. Add the minced garlic and shallots. Lightly stir fry for about 1 – 2 minutes. 3. Add the bacon and continue to stir the garlic, shallots and bacon till the bacon renders its fat. 4. Add the enoki mushrooms and continue to stir fry. 5. As the mushrooms start to wilt slightly, add the white wine and salt and pepper to taste. 6. Don’t overcook the enoki mushrooms; the mushrooms should only be slightly wilted at the end of the cooking. In fact you could certainly finish the cooking part of this dish within 5 – 10 minutes (easy peasy lemon squeezy!). Serve the mushrooms on top of the steaks. You will find that this recipe adds enough flavour to the steak that you would hardly need any additional flavours like mustard or horseradish. As a side, this enoki mushroom dish is an excellent low carb option as 1 cup of enoki mushrooms (approximately 65g weight) has only 3.2g of net carbs. Enoki mushrooms have a slightly sweet taste that balances the saltiness of the bacon. This side dish has a garlicky, winey flavour that perhaps steals some of the thunder from the perfect steak.